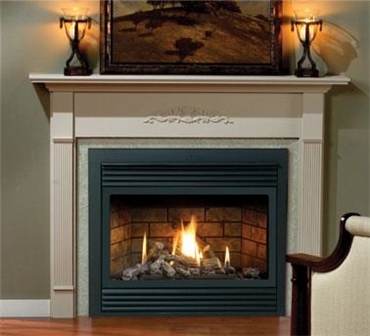 The Solara direct vent zero clearance gas fireplace is a decorator's delight! Your Solara comes with your choice of classic mantel or contemporary wall surround in painted brown, pewter, or black. You can further enhance your Solara with optional decorative black panels or grills; overlay doors; designer doors; and surrounds and mantels. Your Solara direct vent zero clearance gas fireplace is more than a marvel of modern design; it can also provide you with soothing warmth for years to come in your bedroom, bed sitting room or office. The high/low millivolt valve system will operate your Solara during a power failure. The flame sensor will also constantly monitor the pilot flame and provide 100% gas shut off if the pilot is not sensed. Use the form below to request more information on Solara, and a Kastle sales rep will get back to you as soon as possible. Fields in red are required.